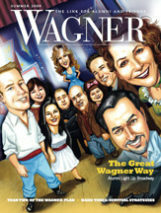 Wagner introduces a new rendition of a familiar icon. Celebrating the College’s centennial on Staten Island with photographs, old and new, side by side. 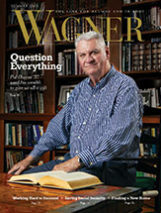 The fall of 2018 marks the start of some very significant events in Wagner history. What was the first play ever staged in Main Hall? Many years before the founding of Wagner’s top-ranked theater program, Wagnerians used Main Hall’s stage for dramatic productions. 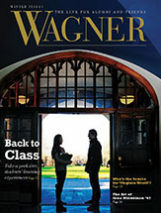 How one of Wagner’s first female graduates fought for her education and became a special education pioneer. Professor Gary Sullivan recalls how he got a car on the WCT Main Stage. A century ago, Lutheran pastor and an anniversary party played key roles in finding this place. During 1949–71, the College added a library, a gym, a student union, a science complex, and dorm rooms for 1,500 more students.